Empire Phoenix Condos will be two towers of 29 & 11 storeys with 499 mixed condo units. The building will feature 40 2-storey ground level suites around the entire podium. The estimated completion date for Empire Phoenix Condos is still unknown. 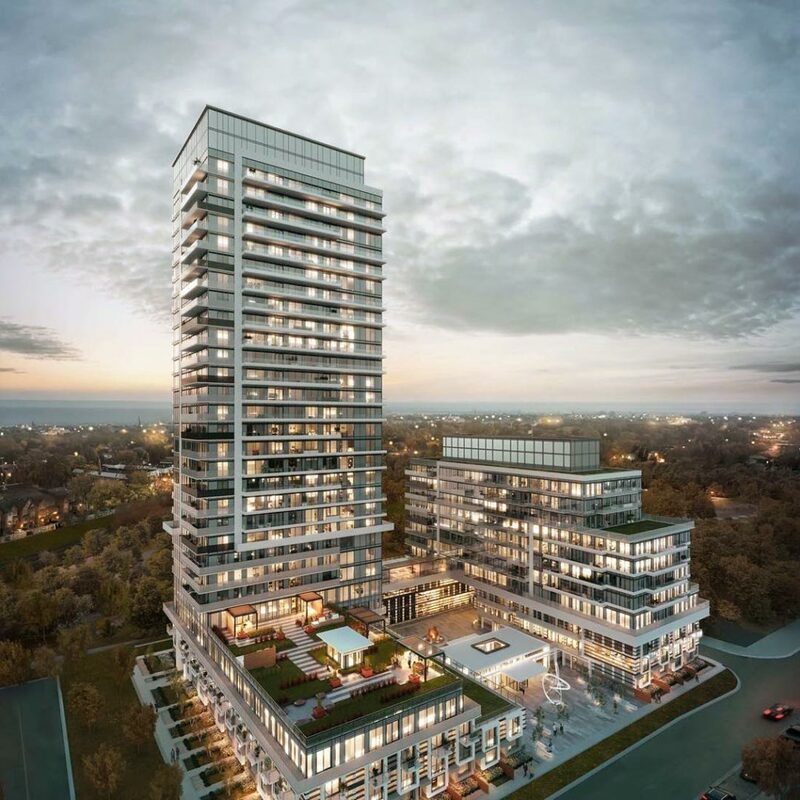 Toronto’s 251 Manitoba Street, Etobicoke will be home to a stunning new condominium, Empire Phoenix Condos. Now in pre-construction, this new condominium by Empire Communities will actually be the first new project to land in Etobicoke’s Mystic Pointe area. Empire Phoenix Condos is planned to consist of two towers soaring 29 and 11 storeys high with 2 storeyed ground level townhomes. It will house a total of 499 mixed condo units comprising 1 bedroom, 2-bedroom and 3-bedroom suites. Suites sizes will be from around 450 square feet to over 1,450 square feet. Launch is slated for June 2018. Empire Condos will feature an array of amenities. These include trendy impressive lobby, 24-hour concierge, guest suite, shared workplace with WIFI, outdoor terrace with group seating plus BBQs, outdoor pool with lounges as well as cabanas, a professionally equipped fitness facility, yoga room, & spa, pet wash station and a lot more. 251 Manitoba Street has an admirable Transit Score of 82/100, meaning transit is convenient for the majority of trips. The area is serviced by 4 different bus routes, which keeps residents connected to many of the destinations. Motorists have quick access to the Gardiner Expressway which is near the project site. Downtown Toronto is 15 minutes’ drive away and just a few minutes’ commute. More transit options are in the pipeline with the planned establishment of a GO Station to the condos’ east to cater for the density along Parklawn Road. As such, the condo could be just minutes to the train, facilitating direct access to Union station. Etobike is located immediately west of Toronto. The development sits in the South Etobicoke’s picturesque and established Humber Bay Park-Mimico area. It’s residential and employment population has been growing necessitating rapid urbanization to accommodate it. It boasts of a many jobs in several fields including corporate, manufacturing and film production. Some younger companies have increasingly been opting to set shop in this west end community – thanks to its amenities and closeness to Toronto. The location is quickly turning into a popular address for those looking for easy access to downtown Toronto, and simultaneously to enjoy lakefront living coupled with the beauty of naturally rolling hills, plenty of green space and leisure. In addition to being secure, the neighbourhood is renowned for its beautiful lakefront parks and vast leisure amenities that include community centres, yatch clubs, swimming facilities and golf courses. It is flanked by Lake Ontario to the south, Mimico Creek to the east, Dwight Avenue to the west, as well as Evans Avenue to the north. Phoenix has numerous local shops and restaurants. It is a well-connected area offering easy and convenient access to downtown Toronto and the suburban neighbourhoods in the GTA. It also connects area residents to nature, something that is rarely easy to achieve in a condo community. Residents at Empire Phoenix Condos will enjoy a number of significant perks. Empire Phoenix Condos offers you a wonderful opportunity to be part of a spectacular lakefront community in one of the GTA’s rapidly growing and urbanizing areas. Mostly, it is a wonderful location to call home. This is not only a favourable location for nature lovers but also a great place for everyone in the family.